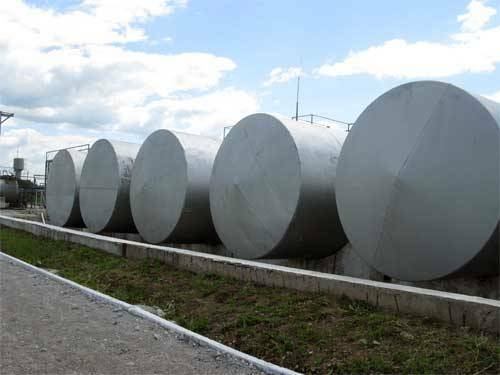 Steel Tanks for Oil and Oil-Products Storage - ! Equipment for Transformer Oil Reclamation. GlobeCore. safety and reliability of filling and emptying equipment. Depending on the possible location tanks for oil and oil-products storage can be underground, semi-underground and aboveground. The bottom of aboveground tanks is at grading elevation or above. The permissible deepening is less than half of the tank. Depth of semi-underground tanks burial is more than half of their height. The highest liquid level is not higher than 2 meters above the grading level. The highest liquid level in underground tanks is at 0.2 meters lower than grading level. Underground tanks are more preferable in terms of safety. This is due to the fact that potential emergency in one of the tanks does not cause any danger for the neighboring tanks. Besides, there is a minimum oil loss during pumping into the other tanks. In case of emergency in aboveground tanks the liquid spreads around the area very rapidly and it is hard to collect. Tank shapes. In practice tank shapes vary: spheroidal, spherical, conical, cylindrical and square shapes for oil and oil-products storage. The form is usually chosen for economic effectiveness which is calculated from tank surface/tank capacity correlation. At the same time this index also characterizes operating costs for inspection, repair and painting. Tank capacity is defined individually for every separate case depending on the technical and economic construction and operation reasons. Metal and nonmetal tanks. Depending on the structural material used, the tanks are divided into metal and nonmetal. Metal tanks in their turn are divided into riveted and welded ones, vertical and horizontal, cylindrical and spherical tanks and tanks of special construction. Nonmetal tanks can be wooden, earth, stone, brick, concrete and ferrocement tanks with the capacity of 100 000 gl. While choosing the tank type it is necessary to take into consideration physical properties of oil products, climate conditions and technical and economic index of building material expenses, labor and equipment costs. Light oil-products storage. In-depth ferrocement tanks for light oil products storage are constructed at tank farms with total capacity more than 200 000 gl and at industrial enterprises warehouses with total capacity of more than 100 gl. It is possible to use metal tanks only in the areas with frozen soil and in seismic active areas with earthquake higher than 6 points. It is also reasonable to use metal tanks in the areas with high level of underground waters and with macroporous collapsible soil. It is permissible to build metal tanks on tank farms with total capacity below 200 000 gl. and on industrial enterprises warehouses with total capacity below 100000 gl. Lubricating oils could also be stored in metal tanks.